After the popularity of LEGO: The Lord of the Rings it was only a matter of time before we returned to Middle Earth for the LEGO adaptation of The Hobbit. Once again be prepared to dive in this authentic, funny version of the fantasy franchise we’ve come to know so well. Just like in the movie, the LEGO version of the Hobbit will take us back to Middle Earth to go on an adventure that will pave the path for things to come. (The Lord of the Rings.) Bilbo Baggins, the man we know as the adventurous type has not always been this way. One day, Gandalf the Grey turns up at Bilbo’s door, to invite him on an adventure. Bilbo declines the offer, to go on with his merry, peaceful and quiet life. Sadly for him, Gandalf has other plans and invites the rest of the ‘fellowship’ of adventurers to Bilbo’s house for a fairly wild dinner party. These dinner guest happen to be the dwarves that were once part of a proud and rich kingdom. The dwarves, led by Thorin Oakenshield, will go on an adventure to reclaim the lost treasures of their kingdom and become a proud and great race once again. To achieve this goal, they need a proper burgler, namely someone that is very light on their feet. This is where our soon-to-be adventurer comes in to play. Hesitant at first, Bilbo gets persuaded and joins this unlikely band of brothers. Whilst the story stays true to the story portrayed in the movie, you’ll be able to enjoy the typical LEGO humor along the way. Be prepared for a few fun twists that will make even the worst situations feel a tad lighter. 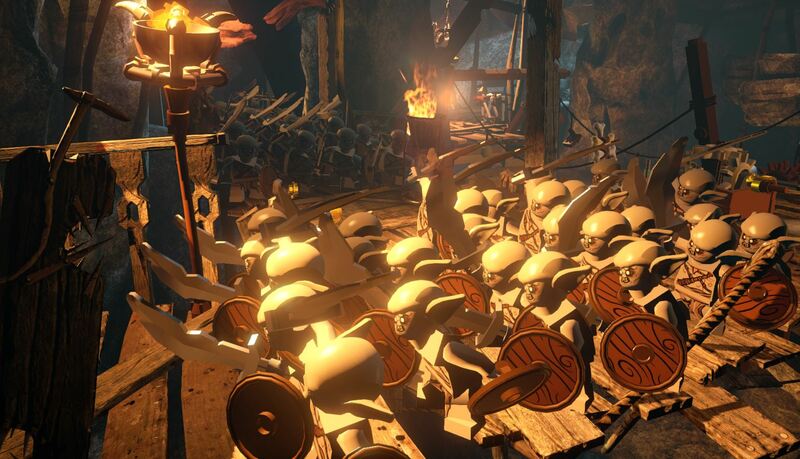 LEGO: The Hobbit follows the typical style of the other LEGO games, where the overall style implements LEGO built objects with more realistic environments and backgrounds. As with the Lord of the Rings version, we are once again treated to a beautiful and detailed version of Middle-Earth. Characters in LEGO: The Hobbit stay true to the original characters but take themselves a tad less serious. You’ll see all of your favorite heroes and villains in a different kind of light. The latest generation of LEGO games which are based on movies, we are once again treated to the original soundtrack of the movie, as well as the voices. Scenes will play, with the original voices, which give it a more authentic feeling. Add the supporting soundtrack to the mix and you’ve got yourself a LEGO version of a great franchise. 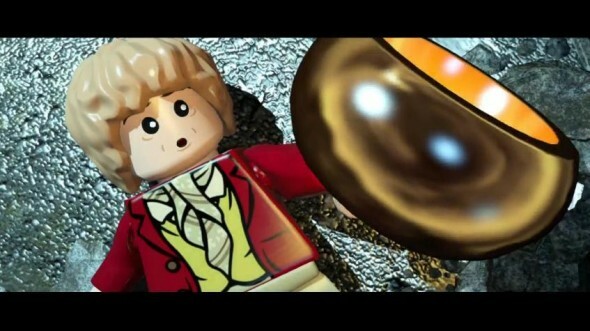 LEGO the hobbit stays true to the formula of the LEGO franchised games. Once again you’ll have to play through the story of the movie with the addition of loads of small side quests. The main storyline follows the story from the movie and thus you will have to plow your way through key scenes from the original story. During these levels you’ll have to collect as many LEGO studs as possible to complete the level with a higher score. Of course there are a lot of puzzles and battles as well, during the course of these missions. Characters in the game have a few different weapon sets for you to mess around with, and some of these are actually needed to continue the pre-paved path of the missions. You’ll sometimes need to break obstacles by using a specific weapon, drag down objects with others and so on. Working together is another key point to completing the missions. You’ll often need to switch characters for you to handle certain obstacles, stand on one’s shoulders or grab your partner for you to do stronger combat moves. Having a lot of options like this is fun to keep the game interesting, but early game this might prove a bit overwhelming, seeing you don’t always know what to do, or what options you actually have. Luckily the game offers a decent amount of ‘hint’ stones, which you just need to punch to hints on how to clear certain puzzles or obstacles. Crafting seems to be getting more and more important in the recent LEGO games. Not only can you build objects throughout the levels, you will also need to collect a lot of crafting materials for you to clear certain objectives or even side quests. You will also encounter certain building mini games in which you will have to select the right brick to continue the construction of certain items. As mentioned above, side quests often consist out of you gathering building materials to create a specific item for your quest giver. When doing so, you will of course be rewarded. The side quests are a decent way for you to explore the world even further, when free roaming. 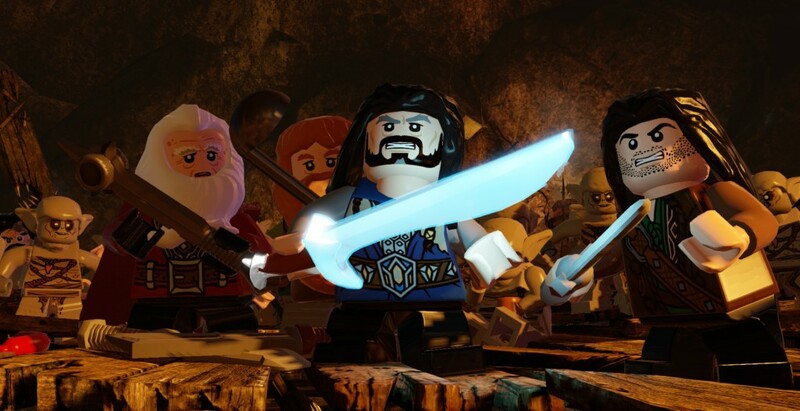 Free roam is also a possibility in LEGO: The Hobbit, which also allows you to gather more and more studs for you to buy extra characters with. When free roaming, after clearing the game, you’ll be able to switch through a lot of characters for you to handle certain obstacles which you could not pass at first. This has to do with the fact that a lot of characters have different abilities for you to destroy or move certain objects. LEGO: The Hobbit once again offers us with a solid adaptation of an already great franchise. You’ll be able to explore the world of Middle Earth once again, with lots of characters to chose from and lots of nooks and crannies to explore. Even though this game is a great asset to the world of LEGO, it’s only a matter of time before these games will become one and the same.